The Classic Dart seems to fly quite well with very little adjustment in the way of fins or flaps. 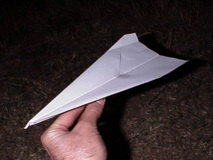 With a little bit of tape holding the paper together at the bottom of the fuselage it flies even better. It can fly far, straight and smooth with a nice glide. This flight test is the "other" classic dart, which I'll call the Dart 2. It's just the simple variation of facing the side with the folding on it up instead of down. 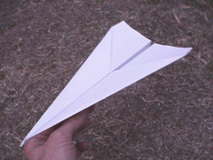 I've hardly ever tried making paper airplanes this way, and now I'm wondering if it might be as good or better. The dart is a good test platform because all other factors can be kept nearly equal. The Dart 2 sort of flops apart when you set it down, but may be able to hold together well enough in flight due to the lift holding up the wings. Test Result: Bad nosedive not easily correctable by bending up the trailing edges of the wings. I put a little piece of scotch tape on the center of the top, which holds the plane together very well. The Flight Test, however, gave the same bad nosedive. I made some upward winglet fins about 3/4" wide, nearly parallel with the top of the fuselage, on the theory that reducing the wing area at the back would move the center of lift forward. The fin folds diverge out just slightly from parallel with the fuselage from back to front though, which can add in a component of downward thrust at the back of the wings. This component can be adjusted somewhat by angling the fins up more or less. Test Result: Flies fabulously with the winglets oriented up about 45 degrees or a little less as shown in the picture. A very smooth and long flight. Was the tape needed, or just the fins? I peeled off the tape leaving everything else the same, and it still flew very well for about 5 flights. So, it seems to be possible to get a Dart 2 to fly well without tape by using fins. After that though, the plane started flopping and I couldn't seem to fix it. I put the tape back on but to no avail. 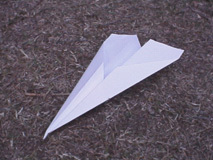 It seems to have just gotten tired, as paper airplanes sometimes do.